Utopia is a word which denotes a community or a society possessing highly desirable or perfect qualities, first used by Sir Thomas More in his 1516 book Utopia, describing a fictional island in the Atlantic Ocean. It has since been used to describe both intentional communities that attempt to create an ideal society, and fictional societies portrayed in literature, and has spawned other concepts, most prominently that of dystopias. The word comes from the Greek: οὐ ("not") and τόπος ("place") and means "no place". The English homophone eutopia, derived from the Greek εὖ ("good" or "well") and τόπος ("place"), means "good place", and the identical pronunciation of "utopia" and "eutopia", gives rise to a double meaning. are castles in the air or counsels of despair. How can there ever be a utopia? There is no right way to live, which we’ve simply failed to stumble upon. There is no set of rules, there is no system, there is no formula. Why should there be? Short of the existence of a creator—and a perverse one, at that—why should there be some blueprint for perfection, just waiting to be discovered? The youth of humanity all around our planet are intuitively revolting from all sovereignties and political ideologies. The youth of Earth are moving intuitively toward an utterly classless, raceless, omnicooperative, omniworld humanity. Children freed of the ignorantly founded educational traditions and exposed only to their spontaneously summoned, computer-stored and -distributed outflow of reliable-opinion-purged, experimentally verified data, shall indeed lead society to its happy egress from all misinformedly conceived, fearfully and legally imposed, and physically enforced customs of yesterday. They can lead all humanity into omnisuccessful survival as well as entrance into an utterly new era of human experience in an as-yet and ever-will-be fundamentally mysterious Universe. 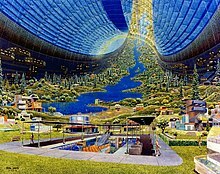 Every daring attempt to make a great change in existing conditions, every lofty vision of new possibilities for the human race, has been labelled Utopian. The founders of a new colony, whatever Utopia of human virtue and happiness they might originally project, have invariably recognised it among their earliest practical necessities to allot a portion of the virgin soil as a cemetery, and another portion as the site of a prison. We must make the building of a free society once more an intellectual adventure, a deed of courage. What we lack is a liberal Utopia, a programme which seems neither a mere defence of things as they are nor a diluted kind of socialism, but a truly liberal radicalism which does not spare the susceptibilities of the mighty (including the trade unions), which is not too severely practical and which does not confine itself to what appears today as politically possible…Those who have concerned themselves exclusively with what seemed practicable in the existing state of opinion have constantly found that even this has rapidly become politically impossible as the result of changes in a public opinion which they have done nothing to guide. Unless we can make the philosophic foundations of a free society once more a living intellectual issue, and its implementation a task which challenges the ingenuity and imagination of our liveliest minds, the prospects of freedom are indeed dark. But if we can regain that belief in power of ideas which was the mark of liberalism at its best, the battle is not lost. I myself think it our bounden duty to believe in such international rationality as possible. But, as things stand, I see how desperately hard it is to bring the peace-party and the war-party together, and I believe that the difficulty is due to certain deficiencies in the program of pacifism which set the military imagination strongly, and to a certain extent justifiably, against it. In the whole discussion both sides are on imaginative and sentimental ground. It is but one utopia against another, and everything one says must be abstract and hypothetical. I will now confess my own utopia. I devoutly believe in the reign of peace and in the gradual advent of some sort of socialistic equilibrium. The fatalistic view of the war function is to me nonsense, for I know that war-making is due to definite motives and subject to prudential checks and reasonable criticisms, just like any other form of enterprise. And when whole nations are the armies, and the science of destruction vies in intellectual refinement with the science of production, I see that war becomes absurd and impossible from its own monstrosity. Extravagant ambitions will have to be replaced by reasonable claims, and nations must make common cause against them. … I look forward to a future when acts of war shall be formally outlawed as between civilized peoples. If we are wrong, Jesus of Nazareth was merely a utopian dreamer that never came down to Earth. If we are wrong, justice is a lie, love has no meaning. ~ Martin Luther King, Jr. If we are wrong, the Constitution of the United States is wrong. And if we are wrong, God Almighty is wrong. If we are wrong, Jesus of Nazareth was merely a utopian dreamer that never came down to Earth. If we are wrong, justice is a lie, love has no meaning. And we are determined here in Montgomery to work and fight until "justice runs down like water, and righteousness like a mighty stream." Martin Luther King, Jr., in Address to the first Montgomery Improvement Association (MIA) Mass Meeting, at Holt Street Baptist Church (5 December 1955). "Justice runs down like water, and righteousness like a mighty stream" is a quotation of Amos 5:24 in the Bible. When I die, I want to die in a Utopia that I have helped to build. In its flexibility and in its wide-open opportunities, this is the total Utopia. Anything that you can conceive of, you can do in this non-world. Nothing can stop you except a total bankruptcy of creativity. The seedbed is waiting. All the circumstances stand ready. The fructifying minerals are literally jumping out of the ground. And nothing grows. And nothing grows. And nothing grows. Well, why doesn't it? We are not utopians, we do not indulge in "dreams" of dispensing at once with all administration, with all subordination; these anarchist dreams ... serve only to postpone the socialist revolution until human nature has changed. No, we want the socialist revolution with human nature as it is now, with human nature that cannot dispense with subordination, control and "managers." ... The united workers themselves ... will hire their own technicians, managers and bookkeepers, and pay them all, as, indeed, every state official, ordinary workmen's wages. To sequester out of the world into Atlantic and Utopian polities, which never can be drawn into use, will not mend our condition; but to ordain wisely as in this world of evil, in the midst whereof God hath placed us unavoidably. Nor is it Plato’s licensing of books will do this, which necessarily pulls along with it so many other kinds of licensing, as will make us all both ridiculous and weary, and yet frustrate; but those unwritten, or at least unconstraining laws of virtuous education, religious and civil nurture, which Plato there mentions, as the bonds and ligaments of the Commonwealth, the pillars and the sustainers of every written statute; these they be which will bear chief sway in such matters as these, when all licensing will be easily eluded. Impunity and remissness, for certain are the bane of a Commonwealth, but here the great art lies to discern in what the law is to bid restraint and punishment, and in what things persuasion only is to work. If the "liberal" mentality is prone to take flights into Utopia, the "reactionary" is guilty of sensing plots in every human enterprise involving hope, enthusiasm, and will to change. The correct attitude of this conflict must stem... from a rediscovery of philosophy which has enough courage to free itself of the historical-ideological-utopian perspective. ...this philosophy must re-emphasize man versus the collective body (with its envisaged collectivized mind), freedom versus the mechanization of inner and social life, common sense versus faith in science. Thomas Molnar, The Decline of the Intellectual (1961) Ch. 11 "Intellectual and Philosopher"
Utopian thinking is not merely futile, it is also profoundly immoral since it contradicts the structure of man's thought and action in its applicability to the world. Since it misleads man, it is an ultimately irresponsible doctrine. The philosopher... denies that good may be so increased as to obscure evil, that man may be substantially changed, and that society may take upon itself the qualities denied to individual man and thus secure happiness for the latter. ..."If we cannot produce virtuous individuals," the utopian says, "let us produce a virtuous society; instead of individual virtues, we shall have social virtues." ...The orientation is to build a social body, a mankind that thinks and acts as one, that is both persuaded and organized in view of becoming "perfect." ...Hence the striking intellectual failure of the idealogue, fruit of his profound immorality. ...his is the sin of pride, the sin that requires the greatest stupidity. It is ironical that he who is committed to a rational-scientific view, should be the real simple-minded one, the poor in the soul. Will it be forgiven him? One persistent strand in utopian thinking, as we have often mentioned, is the feeling that there is some set of principles obvious enough to be accepted by all men of good will, precise enough to give unambiguous guidance in particular situations, clear enough so that all will realize its dictates. and complete enough to cover all problems which actually arise. Since I do not assume that there are such principles, I do not presume that the political realm will whither away. The messiness of the details of a political apparatus and the details of how it is to be controlled and limited do not fit easily into one's hopes for a sleek, simple utopian scheme. The minimal state treats us as inviolate individuals, who may not be used in certain ways by others as means or tools or instruments or resources; it treats us as persons having individual right with the dignity this constitutes. Treating us with respect by respecting our rights, it allows us, individually or with whom we please, to choose our life and to realize our ends and our conception of ourselves, insofar as we can, aided by the voluntary cooperation of other individuals possessing the same dignity. How dare any state or group of individuals do more? Or less? The world has become too dangerous for anything less than utopias. I couldn't survive my own pessimism if I didn't have some kind of sunny little dream. … Human beings will be happier — not when they cure cancer or get to Mars or eliminate racial prejudice or flush Lake Erie — but when they find ways to inhabit primitive communities again. That’s my utopia. That's what I want for me. This page was last edited on 27 February 2018, at 02:38.